Not even a model would dare take the runway in 16 inch heels. 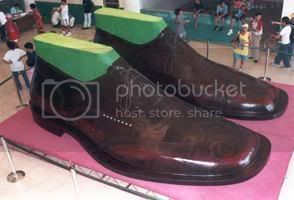 Considering the dimensions of the rest of the World’s Largest Shoes in Marikina, Philippines it just wouldn’t be possible. Measuring over 17 feet long and 8 feet wide, these giant dress shoes could fit 30 normal feet inside of them. Built in Marikina, the capitol of shoe production in the Philippines and the house of Imelda Marcos’ shoe collection, the massive footwear was certified by Guinness in 2002. The creation took a whopping 77 days to finish and cost over 2,000,000 Philippine Pesos. In a country furious with their former first lady’s spending habits, a million Peso per shoe budget seems a little outrageous. Iron Butterfly's personal collection of footwear.